Two women share one fate. A suspected murder at an English Farm. A reported suicide at a local quarry. Can DCI Louisa Smith and her team gather the evidence and discover a link between them, a link which sealed their fate one cold night, Under a Silent Moon? Can you connect the clues to discover the Killer? Solve the crime alongside DCI Louisa Smith and her team. Buy a copy and connect the clues. Elizabeth Haynes is a police intelligence analyst, a civilian role that involves determining patterns in offending and criminal behavior. Under a Silent Moon is her fourth novel; rights to her first, Into the Darkest Corner, have been sold in twenty-five territories. Haynes lives in England in a village near Maidstone, Kent, with her husband and son. I’m a sucker for a good crime novel. I don’t mind blood and grit as long as that characters ring true, and the mystery is somewhat plausible. 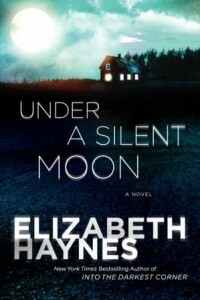 In her latest novel, Under a Silent Moon Elizabeth Hayes provides grit, amazing characters, and a story that is immensely readable. Part conventional thriller, part police procedural, this novel is structured so that we see the tick-tock – the the hour-by-hour countdown of a law enforcement team as they work to solve the a murder, investigate an apparent suicide, and figure out how – and if – each incident is related, while at the same time navigating their personal lives. DCI Louisa “Lou” Smith is the driving force of the novel, and we see much of it from her point of view. I instantly liked her mix of no-nonsense professionalism with just a hint of feminine softness at appropriate times. This novel very much feels like the first in a series, and I would happily read more of Lou’s adventures. She’s as real, as three dimensional as two of my other favorite female crime fighters, Sara Paretsky’s V.I. Warshawski and Margaret Maron’s Sigrid Harald (yes, yes, I know: Maron’s better known for Deborah Knott, but Sigrid’s just AWESOME) and even reminds me a little of the latter, if she were contemporary and British. Lou’s entire team was interesting to see in action, and I’ll confess, for once I had NOT worked out the ending before it was revealed. If you want a gripping story, great characters, and a thriller that truly thrills the imagination, look no further than Under a Silent Moon. Goes well with Shepherd’s pie and a really good stout.